It’s finally here! The 3rd annual Build Your Bundle sale is happening now through May 23, 2016 at 11:59pm EST! 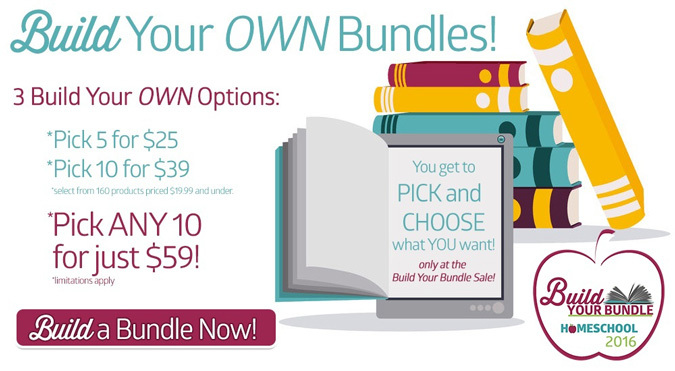 Build Your Bundle is a one week only annual event with deeply discounted homeschool products. I wanted to show you a couple of the featured bundles, but there are MANY more, plus the Build Your Own Bundles, so be sure to visit Build Your Bundle to see all of the offerings. Watch your children develop a love for history with Linda Hobar’s The Mystery of History audio downloads. Math becomes more meaningful with Sir Cumference Set of 6 Living Math Learn N Folders (a $90 value alone!). Help children retain what they learn doing Copywork and Nature Journaling. Charlotte Mason taught that children learn best from “Living Books” – resources written by authors passionate about their topics. With that in mind, we assembled this amazing collection for our Charlotte Mason-inspired Bundle. Do you use copywork, notebooking, and lap books in your homeschool? If not, try it! It’s a wonderful and effective method of learning! This premium bundle features resources from popular publishers like BiblioPlan, Notebooking Pages, A Journey Through Learning – and it covers a wide array of subjects including American History, Anatomy, Nutrition, Famous Poets, Church History, and much more! Do you like surprises? We thought it would be fun to create a Mystery Bundle. You’ll be delighted by this secret collection of resources designed to offer a little something special for everyone! Visit Build Your Bundle to see the rest of the bundles (all at savings of 86-96%) or to create your own bundles.